A convincing win for Dundee United moved them to within five points of second-placed Celtic and helped to put daylight between them and their hosts. Patrick Cregg's deflected shot gave Hibs a first-minute lead, before Jon Daly levelled from the penalty spot. Danny Swanson curled in a beauty to put United ahead, then Hibs' Colin Nish and Daly hit the post at either end. David Goodwillie fired United's third and Francisco Sandaza slotted a fourth before Anthony Stokes' consolation. The Leith side got off to a perfect start when they took the lead within 40 seconds. Ian Murray's low cross from the left-hand corner flag evaded the Terrors' defence and landed kindly for the advancing Cregg, whose right-foot shot from just inside the box was deflected past Dusan Pernis. With their confidence dented by a dip in form in recent weeks, it was the ideal platform from which Hibs could build a victory that would move them above United, who were two points and one league place ahead of their hosts at kick-off. Hibs continued to pressurise the visitors' goal. Derek Riordan swept in a corner from the left that Andy Webster eventually managed to clear, then Riordan took a pot shot but the venom was sucked out of it by the deflection it took when it hit team-mate John Rankin's back. Hogg made a tremendous saving challenge as Daly ran through a central area and was about to unleash a shot when the Hibs skipper made his timely intervention. With Hibernian under the cosh, United were gifted a penalty in the 20th minute when skipper Hogg mistimed his challenge on Daly, sending the Irishman flying in the box. Referee Stevie O'Reilly waved away Hogg's pleas and Daly stepped up to power the spot kick past the despairing Graham Stack. A large part of this game's appeal was the prospect of the contest in midfield. Cregg, Rankin, Lewis Stevenson and Liam Miller were up against United's Swanson, Craig Conway, Morgaro Gomis and Prince Buaben. Despite the intelligent prompting of Miller, it was the tangerine quartet that gradually got the upper hand. If Daly's equaliser had given Hibs manager John Hughes something to mull over as he served his ban in the main stand, then six minutes later his heart would have sank as United's Swanson curled a left-foot shot into the top corner of the net. It was a beautifully executed goal by Swanson, his fifth in the league this season, and one that the travelling support behind the goal enjoyed at close quarters. Colin Nish spurned a chance to level the score just before the interval when he burst clear to connect with a diving header through the United back line. The big striker rounded Pernis but, partly thanks to the speedy recovery of the retreating United defenders, and partly because of hesitation, his only option was to cut the ball back across the goal where it was hoofed clear by a relieved Keith Watson. In the second half, Miller threaded a ball through the inside left channel for Nish to run on to, but luck evaded the Hibs front man when his shot rebounded off the far post, and Sean Dillon blocked Riordan's follow-up strike. At the other end, the unmarked Daly flummoxed Stack when he fluffed a volley from a corner out on the right and his weak effort hit the post. On the hour mark, Goodwillie teased Sol Bamba just outside the box, hoping the big defender would make a lunge. Instead, Bamba resisted making any challenge at all and the United striker nudged the ball beyond his marker and rifled a low shot past the helpless Stack. As Hibs became frustrated, Cregg was booked with 18 minutes to play for a rash challenge on Conway, and, seconds later, Abdessalam Benjelloun came on for Nish, who by this point had realised it was not going to be his evening. 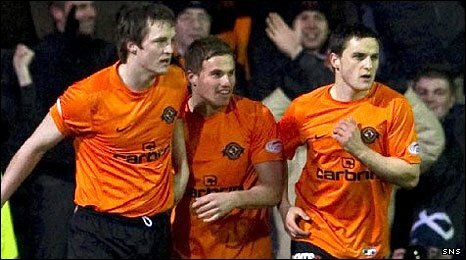 As the final whistle loomed, substitute Sandaza made it four for rampant United, when he received Goodwillie's pass in a central position, kept his cool and poked the ball through Stack's legs. In injury-time Stokes, a second half substitute for Stevenson, got on the end of a clever Riordan ball and beat Pernis from close range for his 20th goal of the season. It did no more than make the scoreline more respectable for the dejected Hibs fans, who booed at the final whistle. 90:00+3:22 The referee brings the game to a close. 90:00+1:34 Assist by Liam Miller. 90:00+1:34 GOAL - Anthony Stokes:Hibernian 2 - 4 Dundee Utd Anthony Stokes scores a goal from close in to the bottom right corner of the goal. Hibernian 2-4 Dundee Utd. 90:00+0:25 Substitution Kevin Smith is brought on as a substitute for Craig Conway. 90:00+0:04 Foul by David Goodwillie on John Rankin, free kick awarded. Free kick taken by Ian Murray. 88:55 Substitution Andis Shala is brought on as a substitute for Jon Daly. 87:35 Assist on the goal came from David Goodwillie. 87:35 GOAL - Francisco Sandaza:Hibernian 1 - 4 Dundee Utd Francisco Sandaza finds the net with a goal from inside the penalty area low into the middle of the goal. Hibernian 1-4 Dundee Utd. 86:54 Abdessalam Benjelloun fouled by Morgaro Gomis, the ref awards a free kick. John Rankin crosses the ball in from the free kick, clearance by Andy Webster. 83:36 Unfair challenge on Keith Watson by Derek Riordan results in a free kick. Andy Webster takes the direct free kick. 83:04 Francisco Sandaza challenges Liam Miller unfairly and gives away a free kick. Chris Hogg restarts play with the free kick. 82:01 Garry Kenneth restarts play with the free kick. 82:01 Substitution Francisco Sandaza replaces Daniel Swanson. 82:01 John Rankin challenges Prince Buaben unfairly and gives away a free kick. 81:22 Inswinging corner taken right-footed by John Rankin, clearance made by Garry Kenneth. 80:59 Corner taken by John Rankin from the right by-line played to the near post, clearance by Prince Buaben. 80:29 Corner taken by John Rankin from the right by-line to the near post, Dusan Pernis makes a comfortable save. 79:35 Liam Miller delivers the ball. 77:53 A cross is delivered by Anthony Stokes. Ian Murray sends in a cross, Anthony Stokes takes a shot from just inside the penalty box which clears the crossbar. Correction - 73:28 Sean Dillon crosses the ball from the free kick right-footed from left channel, Souleymane Bamba manages to make a clearance. Correction - 73:28 Substitution Abdessalam Benjelloun comes on in place of Colin Nish. Correction - 73:28 Booking Booking for Patrick Cregg. 73:28 Sean Dillon crosses the ball in from the free kick, clearance made by Souleymane Bamba. 73:28 Substitution Colin Nish goes off and Abdessalam Benjelloun comes on. 73:28 Booking Colin Nish receives a caution for unsporting behaviour. Correction - 73:17 Patrick Cregg challenges Craig Conway unfairly and gives away a free kick. 73:17 Foul by Patrick Cregg on Craig Conway, free kick awarded. 72:33 David Goodwillie handles the ball and concedes a free kick. Chris Hogg takes the direct free kick. 70:06 Handball by Keith Watson. Derek Riordan delivers the ball from the free kick right-footed from left channel, clearance made by Garry Kenneth. 69:04 Corner taken by Derek Riordan. 68:41 Inswinging corner taken left-footed by John Rankin from the right by-line, clearance made by Garry Kenneth. 68:17 The ball is delivered by Anthony Stokes, Colin Nish takes a shot. 67:08 Corner taken right-footed by John Rankin, save by Dusan Pernis. 65:59 Derek Riordan challenges Morgaro Gomis unfairly and gives away a free kick. Morgaro Gomis takes the direct free kick. 65:17 Free kick awarded for a foul by Liam Miller on Craig Conway. Craig Conway crosses the ball from the free kick right-footed from left wing, save by Graham Stack. 64:17 Free kick awarded for an unfair challenge on Ian Murray by Jon Daly. Ian Murray takes the free kick. 63:08 Inswinging corner taken from the left by-line by Craig Conway, comfortable save by Graham Stack. 62:44 Corner taken by Craig Conway played to the near post, clearance made by Chris Hogg. 62:16 Free kick awarded for a foul by Ian Murray on David Goodwillie. Daniel Swanson restarts play with the free kick. 61:24 Jon Daly is caught offside. Free kick taken by Graham Stack. 60:51 Substitution Anthony Stokes is brought on as a substitute for Lewis Stevenson. 59:48 GOAL - David Goodwillie:Hibernian 1 - 3 Dundee Utd David Goodwillie scores a goal from just inside the penalty area to the bottom left corner of the goal. Hibernian 1-3 Dundee Utd. 58:00 Free kick awarded for an unfair challenge on Prince Buaben by Colin Nish. Sean Dillon takes the free kick. 55:09 John Rankin gives away a free kick for an unfair challenge on Andy Webster. Dusan Pernis takes the free kick. 54:35 Liam Miller fouled by Craig Conway, the ref awards a free kick. Chris Hogg restarts play with the free kick. 53:46 Corner taken by Prince Buaben played to the near post, Shot by Jon Daly from deep inside the area bounces off the post. 52:07 Colin Nish has an effort at goal from deep inside the box hitting the post. 49:59 Unfair challenge on Liam Miller by Sean Dillon results in a free kick. Liam Miller takes the direct free kick. 47:20 Steven Thicot crosses the ball, Daniel Swanson makes a clearance. 46:44 David Goodwillie challenges Souleymane Bamba unfairly and gives away a free kick. Graham Stack takes the free kick. 45:30 John Rankin takes a inswinging corner. 45:00+1:29 The players leave the pitch at half time. 45:00+0:02 Lewis Stevenson challenges Daniel Swanson unfairly and gives away a free kick. The free kick is swung in right-footed by Prince Buaben, Chris Hogg manages to make a clearance. 44:27 Unfair challenge on Sean Dillon by Steven Thicot results in a free kick. Dusan Pernis takes the direct free kick. 43:50 The ball is swung over by John Rankin. 42:59 Colin Nish takes a shot. 41:22 Handball by Liam Miller. Andy Webster takes the free kick. 38:25 Liam Miller concedes a free kick for a foul on Craig Conway. The free kick is delivered left-footed by Garry Kenneth from own half, clearance by Ian Murray. 36:28 Free kick awarded for a foul by Liam Miller on David Goodwillie. Free kick taken by Morgaro Gomis. 35:33 Patrick Cregg challenges Craig Conway unfairly and gives away a free kick. Garry Kenneth takes the free kick. 35:20 The assistant referee signals for offside against John Rankin. Indirect free kick taken by Dusan Pernis. 31:53 David Goodwillie concedes a free kick for a foul on Chris Hogg. Free kick taken by Graham Stack. Correction - 31:07 Unfair challenge on Daniel Swanson by Derek Riordan results in a free kick. Free kick crossed by Keith Watson, Steven Thicot manages to make a clearance. 31:07 Free kick awarded for a foul by Derek Riordan on Daniel Swanson. Keith Watson crosses the ball from the free kick right-footed from right wing. 30:13 Free kick awarded for a foul by Colin Nish on Andy Webster. Dusan Pernis takes the free kick. 29:43 Free kick taken by Chris Hogg. 29:43 Booking Booking for Morgaro Gomis for dissent. 29:26 Morgaro Gomis gives away a free kick for an unfair challenge on Patrick Cregg. 28:47 Patrick Cregg is penalised for handball and concedes a free kick. Direct free kick taken by Andy Webster. 25:43 The assist for the goal came from Craig Conway. 25:43 GOAL - Daniel Swanson:Hibernian 1 - 2 Dundee Utd A goal is scored by Daniel Swanson from the edge of the penalty box to the top left corner of the goal. Hibernian 1-2 Dundee Utd. 24:51 Outswinging corner taken by Craig Conway, Liam Miller manages to make a clearance. 22:54 Corner taken by Craig Conway, Andy Webster has a header from close in and clears the crossbar. Correction - 20:36 The offside flag is raised against Colin Nish. Dusan Pernis takes the free kick. 20:36 The official flags Colin Nish offside. Dusan Pernis takes the free kick. 19:27 GOAL - Jon Daly:Hibernian 1 - 1 Dundee Utd Placed penalty scored by Jon Daly. Hibernian 1-1 Dundee Utd. 18:29 Chris Hogg challenges Jon Daly unfairly and gives away a Penalty. 15:20 Inswinging corner taken left-footed by John Rankin. 14:45 The ball is delivered by Steven Thicot, Andy Webster manages to make a clearance. 12:09 Centre by John Rankin, clearance made by Craig Conway. 11:43 The ball is sent over by Jon Daly, clearance by Patrick Cregg. 10:48 Prince Buaben takes the outswinging corner, clearance by Liam Miller. 10:05 Free kick awarded for a foul by Colin Nish on Prince Buaben. Prince Buaben restarts play with the free kick. 8:47 Inswinging corner taken right-footed by Craig Conway from the left by-line to the near post, clearance made by Colin Nish. 7:58 Foul by Chris Hogg on David Goodwillie, free kick awarded. Craig Conway delivers the ball from the free kick right-footed from left channel, clearance by Colin Nish. 6:48 Shot from just outside the penalty box by Derek Riordan misses to the left of the target. 5:31 Prince Buaben crosses the ball from the free kick left-footed from left channel, Ian Murray makes a clearance. 5:31 Booking Booking for Liam Miller for unsporting behaviour. 5:22 Free kick awarded for a foul by Liam Miller on David Goodwillie. 4:08 Inswinging corner taken right-footed by Derek Riordan played to the near post, Andy Webster manages to make a clearance. 2:48 Jon Daly challenges Ian Murray unfairly and gives away a free kick. Graham Stack restarts play with the free kick. 1:57 Souleymane Bamba concedes a free kick for a foul on Jon Daly. Craig Conway crosses the ball from the free kick right-footed from left channel, Chris Hogg manages to make a clearance. 0:59 Ian Murray provided the assist for the goal. 0:59 GOAL - Patrick Cregg:Hibernian 1 - 0 Dundee Utd Patrick Cregg finds the back of the net with a goal from inside the area to the top right corner of the goal. Hibernian 1-0 Dundee Utd.